Foundant Technologies, Inc. — Can foundation staff submit for an applicant? Administrators have the ability to proxy in as any user in the system, including applicants. To submit a form for them follow these steps, it is best to utilize the quick proxy feature from the Form. Locate the form in the Form in its corresponding LOI, Application or Follow Up draft stage. Select the review icon next to the form. Click on the user's email address from the Contact Info tab. 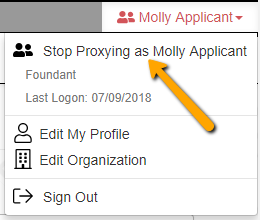 Return to your administrator account by clicking on the proxied user’s name in the upper right corner of the screen, and selecting Stop Proxying as. You can now mark the form complete as an administrator.